/ Want to Eat More Raw Vegetables? 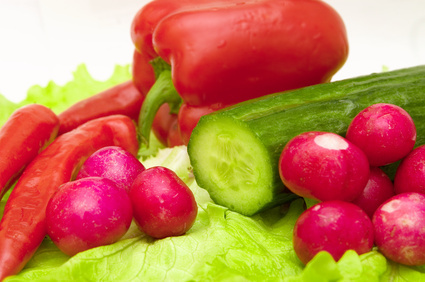 Want to Eat More Raw Vegetables? article adapted from livestrong.com - a great source for health, nutrition and fitness! Raw vegetables offer fiber, antioxidants and numerous vitamins and minerals, but munching on them plain can make you feel like a rabbit. You can kick up the flavor by using them in creative ways and as a substitute for higher-calorie, nutrient-poor fare like chips and pretzels. According to the Centers for Disease Control and Prevention (CDC), people who eat more generous amounts of fruits and vegetables as part of a healthy diet reduce their risk of chronic diseases such as stroke, cancer, type 2 diabetes and heart disease. Salads are a natural for raw vegetables, but the salad often served up in restaurants or the American home consists of iceberg lettuce, a gassed tomato and a few slices of cucumber with a slathering of ranch or Italian-style dressing. Make your salads more appealing by focusing on richly colored greens such as romaine, spinach and baby arugula. Unlike iceberg, these lettuces impart flavor and contain significant antioxidants that help fight disease-causing free radicals in the body. Eat a spinach salad with dried cranberries, sliced raw onion and heart-healthy walnuts. Try arugula with shredded carrots, diced apple and pecans. Romaine may be the classic base for a Caesar salad, but you can add to its nutritional value by tossing it with avocado, salsa and black beans. Salads do not always have to include lettuce. Use celery as a base with diced bell pepper, jicama and walnuts, and dress it with a citrus vinaigrette. You may think of coleslaw as a cookout standby, but consider cabbage as a base for other salads. Shred raw Napa cabbage and add edamame, almonds and an Asian dressing. Thinly slice raw zucchini and yellow squash and toss with lemon, olive oil and basil as a pairing for simple roasted or grilled fish. A crudite platter with the ubiquitous cup of mystery dressing often sits untouched at a party. Make it appealing by dressing up the dip and the vegetable offerings. Try jicama, endive, green onions or fennel as dippers, and serve them with hummus, baba ganoush or tahini. Instead of using tortilla chips to dip in salsa or melted cheese, try endive leaves, which are cupped and make a perfect scoop. Serve a classic cheese fondue and offer raw vegetables as dippers instead of cubes of bread. Experiment with bagna cauda, an Italian broth-based dip made with olive oil, anchovies and garlic, which pairs well with raw zucchini and bell peppers. Instead of reaching for nutrient-poor white bread, try wrapping your next snack with a large leaf of romaine or butter lettuce. Use lettuce leaves in place of taco shells to provide crunch and a cooling contrast to the warm filling. Spread nut butter on celery sticks to save calories and obtain more fiber than you would if you used white toast. Make a raw hummus with sprouted chick peas, but instead of spreading it on a roll, eat it dip-style with carrots, bell peppers and grape tomatoes. Here's a great recipe for a raw sunflower seed dip in place of packaged dips!